Christopher Nolan’s Interstellar is finally taking moviegoers into space next week, after what feels like an era of waiting. But this extended drama isn’t only extrapolations of theories provided by physicist Kip Thorne, and you’ll find a surprising take on an old conspiracy theory in the clip below. Wait, wait, wait. Here we are, in the future, where people are supposed to be a lot smarter than we are now, despite them living in a world that is slowly drying out and dying. But Nolan is trying to tell us that the path of history has turned so that arguably the biggest event in human history has been wiped away and replaced by one of the most crackpot “truther” theories out there? In the clip, Matthew McConaughey’s Cooper is speaking with his daughter Murph’s (Mackenzie Foy) school teacher, who gives the requisite “Your kid is great,” line before diving into the bigger issue at hand. Murph brought an old textbook to class, one that referenced the Apollo moon landing, which has since been redacted from textbooks (and history, seemingly) by the U.S. government. Our country is now of the opinion that the original moon landing was faked as a way of bankrupting the Soviet Union. And Cooper appears to have no idea that this is the new mandate, which makes me wonder what kind of a communication line is being dangled by the government in these trying times. Pissed off and calmly flabbergasted, Cooper questions this, and the teacher just goes on about how NASA’s efforts were all wasteful and led to the construction of “useless machines.” One quote in particular makes my brain hurt—”We need to teach our kids about this planet. Not tales of leaving it.” That’s completely backwards to the train of thought that living on a dying planet would inspire. Cooper then gets off a little emotionally charged story about his wife not having any more MRI tech that would have caught the cyst in his wife’s brain, but even that bit of heavy-handed material can’t stack up to the fact that people don’t believe in the moon landing here. I’m guessing the documentary Room 213 is now taught as reality. While I’m almost disgusted that such a dumb idea is being taught in schools in the future, it actually makes me more intrigued to see what other ways Nolan and his screenwriter brother Jonathan have adapted mankind’s timeline. Maybe they’ll tell us how all the new Star Wars films will turn out. 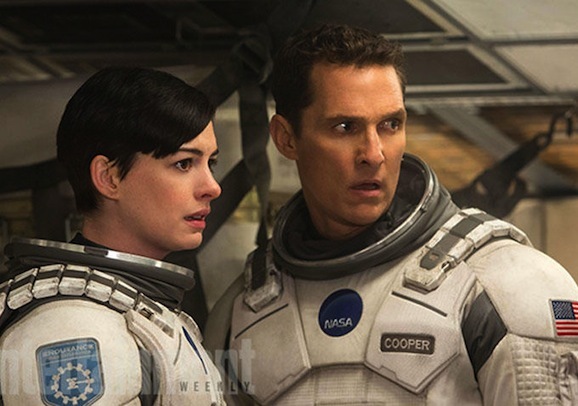 With a cast that also includes Anne Hathaway, Michael Caine, Jessica Chastain, Ellen Burstyn, Wes Bentley, Casey Affleck, Topher Grace, John Lithgow, and many more, Interstellar will hit every kind of theater imaginable on November 7, though select screenings will begin on Wednesday, November 5. Bring your favorite science textbook to the theater and get no money off of your ticket.